Hinode is the third Japanese satellite for the observations of the Sun, following Hinotori (launched in 1981) and Yohkoh (launched in 1991). Hinode was launched on September 23, 2006, and has been continuously operated till today. The scientific objectives of the Hinode mission are to investigate how the Sun’s surface layer behaves dynamically and interacts with the magnetic field, and how the upper atmosphere of the Sun is heated to high temperatures in responding to the activities in the surface layers. The largest instrument onboard Hinode is the Solar Optical Telescope (SOT), a 50 cm aperture optical telescope. SOT is the largest space-borne telescope ever flown and has an angular resolution of 0.2 arcsec (about 150 km on the Sun). With its unprecedented resolving power, the Hinode/SOT has discovered many new phenomena. 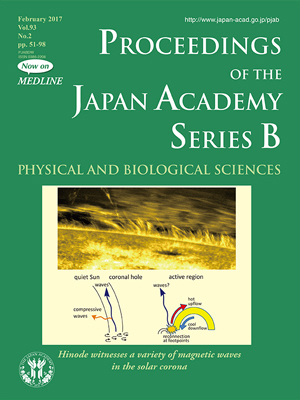 The cover photograph (top) shows thread-like structures (called prominences) which are observed at a wavelength of 396.8 nm emitted by the singly-ionized calcium ions. These threads represent cool plasmas with a temperature of around 104 K, floating in the hot corona of 2×106 K. A time series data show that they oscillate up and down with a period of 2-4 minutes, and their amplitude of oscillation is 400-1800 km. As the threads are believed to delineate the magnetic field lines in the corona, the observed motion implies magnetic waves. Using the estimated density and the magnetic field strength, the wavelength of this oscillation is found to be 2.5×105 km (36% of solar radius), which is much larger than the horizontal size of the observing region of 80000 km so that the threads oscillate nearly in phase all over their length in the field of view. In this volume (pp.87-97), Takashi Sakurai summarizes the researches related to the heating of the solar corona to its million-degree temperature (cover photograph, bottom). In regions of weak magnetic fields, waves can carry the energy to heat the corona. In regions of strong magnetic fields, mechanisms more directly related to the interaction of magnetic fields (the so-called magnetic reconnection) might be the main source of energy. Heating by waves was the oldest idea of coronal heating, but had given way to the reconnection-based models and was less popular until recently. The revival of the wave heating theory is one of the significant contributions of Hinode in solar physics.